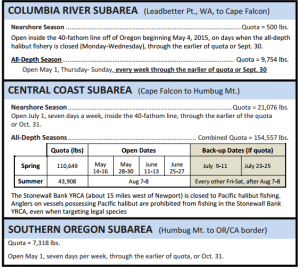 The season officially opened up today for the Central Coast anglers looking to reel in a Pacific Halibut. Always refer to the Oregon Department of Fish & Game website for any changes that may occur with the regulations for marine fishing. The halibut season is very regulated to ensure that there is ample fish for everyone that wants to go and give it a shot to reel in one of these delicious bottom dwellers up from the depths. 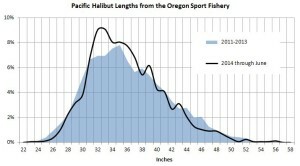 The season runs on specific days for all depth fishing and near shore opportunities as well as having regional quotas for total weight brought in by all sport anglers, that once reached closes, the fishery for the season. If you like to fish in the ocean and have never had the joy of reeling up a halibut from 800 feet off the bottom it is an experience / workout that you should experience. The bites can be super soft where the rod just loads up or hard and instant when the bait just gets inhaled and the fish starts moving. Then the work begins trying to pry it off the sea floor and up to the surface. Nothing like halibut tacos or a big cheek on the BBQ. 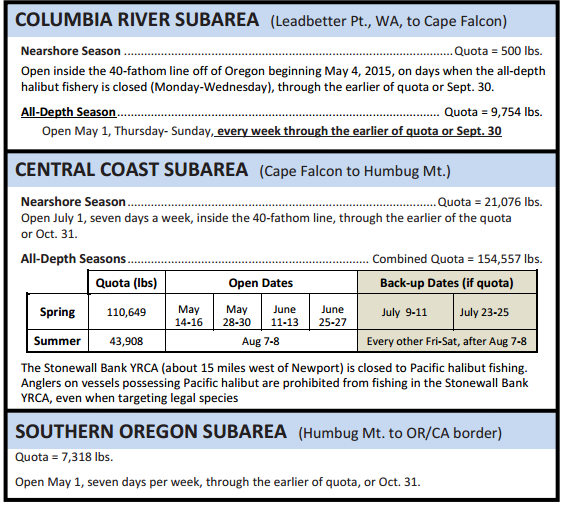 Nearshore began May 4, 2015 on days the all depth fishery is closed until the quota is caught or September 30. Nearshore opens on July 1, seven days a week, inside of the 40 fathom until the quota is reached or October 31. There are back up dates if the quota is not met. Only has a quota of 7,318 lbs and opened on May 1 and open seven days a week through the quota being fulfilled or until October 31. Good luck out there and hopefully you catch a big one.